I am lucky enough to work with dog lovers every year. I think they find me because I’m a dog lover. We can smell our own. But in 2018 we had a bunch of venues that were dog-friendly, so along came Baci, Harper and Stella, to hang out with us on the wedding day! If you make it to the bottom, there is a special surprise for you! Sadly, I don’t have any past dog blog posts to share with you, but I did enough for a wedding animals round up in 2016. Looking for more 2018 wedding goodness? 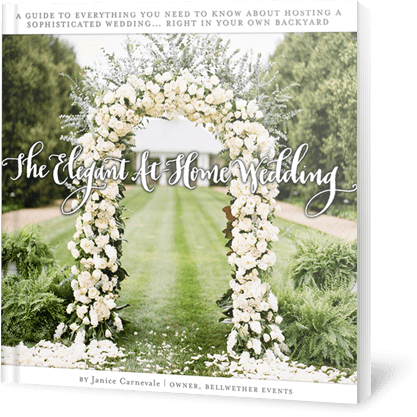 I’ve got all the links for you: real wedding stats/data, real wedding cakes, real wedding shoes, real wedding bouquets, and real wedding invitations. Harper’s wedding day scheduled included joining the portrait session, processing to the ceremony, participating in the first dance, and watching the reception until she was tuckered out. Two older cousins and their parents were the assigned handlers but there was no shortage of hands willing to help out with this sweetie. Harper wore a coordinating bow tie and a floral collar on the wedding day. Stella was handled by her professional trainer on the wedding day, but she hung out with the wedding party most of the time. She joined us at the wedding for pre-ceremony portraits, and hung through the cocktail hour. Her copper leash matched the wedding color palette and her floral collar matched the bridal bouquet. Boci attended the Jewish wedding ceremony of his caregivers, and appropriately donned a yarmulke as well as a matching bow tie. Unfortunately he wasn’t able to stay longer than the wedding ceremony. I promised something fun if you made it to the bottom. Surprise! Larry and I with our pup, Nikki, at our wedding. We had adopted her about 6 months earlier. My aunt and uncle took on her care (walks and feeding) on the wedding day, and we were so grateful.